Sparkling Adventures -✯- Celebrating two! 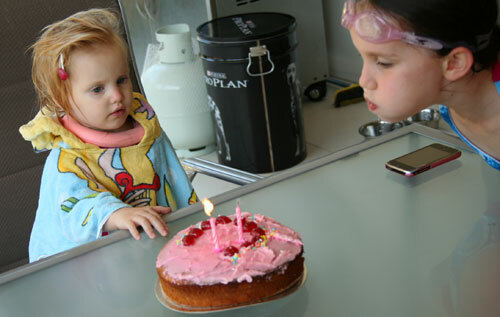 Today we marked Cali's birthday with two candles on a cake. Calista has been following after her older sisters, desperately wanting to join in with their games, but not quite fitting in. She’s at a terrible in-between age where she’s not a baby but not quite grown-up enough to join in with their games. I have enjoyed watching her ability to fully engage in make-believe — one time Aisha kept telling her to go have a bath, and Calista would run to the corner of the room, pretend to splash around and then return to Aisha. I’ve also spied her with two little figures, enacting a conversation between the toys. Calista hit her mouth on the bath a couple of nights ago and lost a chunk out of one front tooth. Calista remains an affectionate little girl. She loves to say “please” and “thank you” and smiles so broadly that all wrongs are easily forgiven. She answers to David’s nickname for her — “Booty” — and he likes to tell her she’s beautiful. “Yes!” she agrees emphatically. 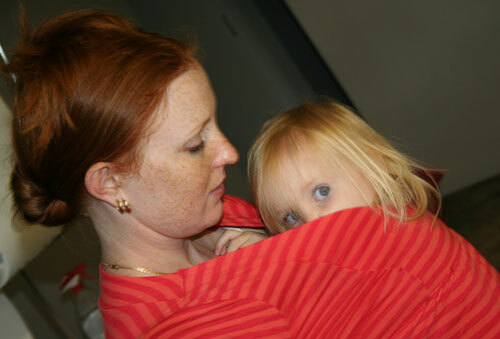 One evening Calista complained of being cold, so I put her in my shirt. Today we were able to visit D and her sister J at home, as she was discharged from hospital yesterday. The girls were so excited to see their friends again. 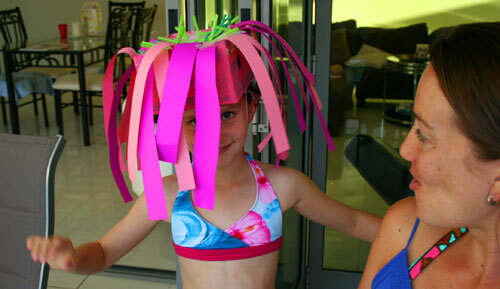 I was so impressed by J's sea anemone headdress. Doesn't it look great? She created it for a performance at school. The girls were happy to all get into the pool together. Allison and I were just as pleased that *we* didn't have to! It was especially precious to be celebrating Calista’s second birthday with Allison and her girls. 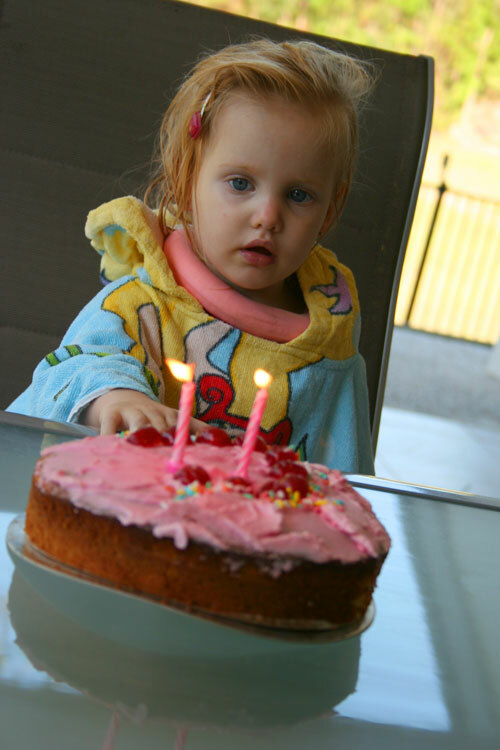 At the beginning of our friendship several years ago, we marked Aisha’s second birthday together. J helped Cali blow out the candles. The lollies, chips and cake made our little gathering into a special party for the girls. Oh my gosh that kissing video is SO CUTE!! 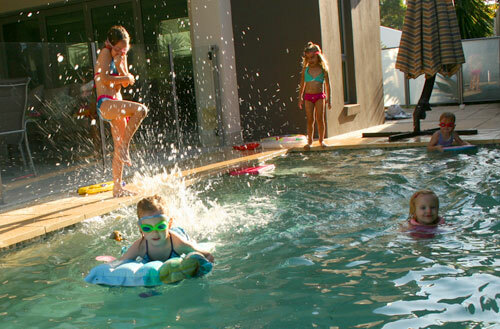 I LOVE all the photo’s especially the one of all the kids in the pool. Aww Happy Birthday to your precious girl. Great pictures and Great blog, Lauren! ... and especially thank you for the lovely picture of J’s headdress! BEEEUUUTIFUL!! Love your blog! Yes,I love your blog too! Fancy Calista being 2!